When Fan Art goes Manga: Western Science Fiction Icons Reimagined, Japanese-Style! Manga and anime have had a huge impact on western art in general — but they've especially helped to shape fan art. These cool Japanese art styles have helped us to see our favorite Western science fiction and fantasy icons in a whole new way. 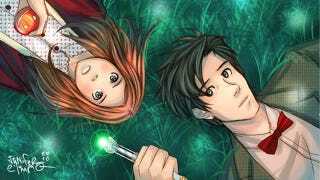 Here are some of our favorite manga and anime-influenced pieces of fan art for Doctor Who, Star Trek, Buffy and other great series. Top image: Doctor Who - Imaginary Friend by Bob Psycho on Deviant Art. Heta Who by Alikurai on Deviant Art. Allons-Yyyy by Alikurai on Deviant Art. Star Trek TOS Epic by Go-Devil-Daisuke on Deviant Art. Galactica the Animated Series by MUDCAT on Deviant Art. Buffy by NicoleArt on Flickr.